Those who go regularly don't need this. 70% of the time you can go that way, just the few larger games you have the inconvenience of not being able to - and this annoys me too because my direct route home is that way. Clearly the OP doesn't go to games often. Too right, we have way too many foolish naive fans, and if there's one thing I can't abide it's foolishness. Don't take young uns to a game like the derby, and if you do don't complain when it kicks off. Two ways it could have been handled. 2. Announce and prevent fans in Leppings Lane Stand from leaving for 15 minutes. Just seemed like chaos in Leppings Lane with police wielding batons if only briefly. It really isn’t rocket science to prevent this. Police prob reason for low attendance, the gap between North and West was huge with a steward front line at each side,.. Totally needless. 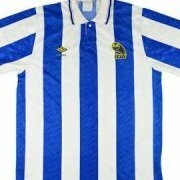 Hillsborough holds 39.000 yet 8.000 seats lost. Merseyside derby other night had hardly any segregation and a similar classic stadium had 39.000. Police fault or club? Saw about 6 coppers all night. Felt like any other night game. Admit it , come on, you watched it on TV didn’t you. It's all for show; nothing more. You've got police decked out like stormtroopers and helicopters flying around the place like WWII. SYP - you are a garbage police force and, irrespective of who may or may not have been responsible, you right royally f00ked up nearly 30 years ago and we have had to deal with the consequences ever since. Your pathetic show of force tonight (or any other night) doesn't cover up for how utterly inept you are. I'd be happy to wager it's the "most expensive football game to police" because it says so in their budget application. If they report an underspend over the course of the year, they get a pat on the back...and a budget cut next year. Self-fulfilling prophecy. And I'm quite sure they hope to keep it that way. All week they’ve told us they’d keep them behind for 10 minutes after the game. Never heard of a snokw bomb before. Sounds reyt nasty, did they have some Isil sleepers in their lot? Oh mind you they couldn't have , Isil don't like Pork! I'd have just locked the doors and thrown away the key! I'm guessing you're taking the wee wee. 3 or 4 riot vans and plenty of Robocops right outside the Bridge. Then walked up Parkside Road a few more Robocops on the Toad but flashing lights in the Park at least 4 Cop cars on the path in the Park (I've never seending this before and I've going over 40 years). Got to Middlewood Road tram Stop, plenty more Stewards and Robocops around there and God knows how many Marias lined up. I then got in my car and drove down to Hillsborough corner (I wanted to park round back of Riverside) turned up taplin Road to go back on myself on Holme Lane towards Bradfield Road, to be met by more coppers. Couldn't get down Bradfield Road so had to go right back up Holme Lane, towards Rivelin and up over Walkley to come back down to Park up behind Riverside. Quick pint in Riverside, couldn't find my mates so had a walk across to Hillsborough tap, not sure how long after match had finished by now, but loads more Robocops, about 4 more riot vans and mounted police as a tram was due through. Hillsborough Tap locked so walked across to Shakey, (I only wanted a bloody pint with my mates!) Another 2 riot vans parked in entrance to where the Ball used to be. Never seen anything like it, I'm certain there would have been less had there have been a terrorist act. This doesn't even mention the poo loads I expect were on Leppings Lane after the match. Talk about overkill, it's our bloody tax money they're spending. Bet they bloody loved it, extra overtime and the opportunity to crack (I'm mean exert their authority on) a few football fans. Wouldn't mind but I work at supermarket, when we ring em cos we have shoplifters or aggressive customers it takes em over an hour to get there. Next time I'm gonna tell em we've got some boisterous football fans, bet they'll be there in minutes. Waste of tax payers money, the lot of em. Rant over. SiJ has it right, SYP are the most incompetent police force in Britain. Their command structure screwed up in 89 leading to a disaster and the way they do business now is to prevent another wee wee tail up at all costs. Parked in Morrisons top car park. Got to car at 10pm. Still sat waiting at 10.30. Copper was stopping everyone from leaving until trams etc had gone. I went up and had a word, along with a few others. I stood in the middle of the road, no cars, and asked him why we couldn't get out. Said he had orders not to let anyone go. Asked if he could make his own decision and let us go as it was safe, even if he'd turned everyone left so nobody went towards Hillsborough, still no. I started getting a bit sarky with him and decided I'd best go back to my car before I said owt too bad. To be fair he was following orders, but the orders were ridiculous. Took me 6 minutes to get home once I was let out. Syp aren't very good at some things. The point being it wouldn't have kicked off if they'd kept the scrubbers in for ten minutes as they said! Dude, is that even funny? I took my son and his favourite player is Bannan. I hope he'll grow out of it and maybe look towards someone like Reach or Lees, but who knows. Anyone know when the nominations need to be in for them Pride of Britain awards? No wonder it costs so much. Reinforcements brought in from Durham police. Probably 100 or so plus vans etc. Overtime, mileage, grub etc. etc. all out of the people of Sheffields council tax. It just seems like overkill. I've been to every derby for 30 years and the policing gets more high profile every year and there are there very few incidents. Nothing compared to the recent events at the horse racing for instance.